If you love candy, you’re going to go crazy about these ooey gooey chocolatey Milky Way Brownies! 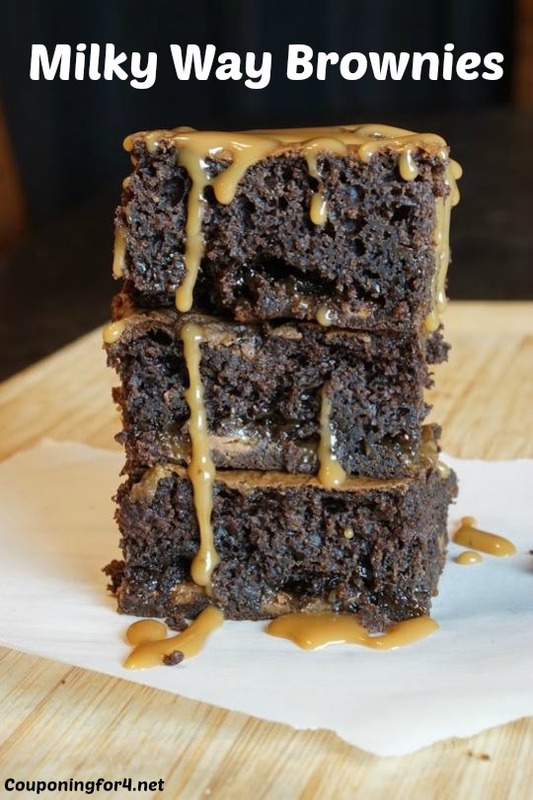 Full of chocolate and topped with caramel, this deliciousness is about to be your new favorite – particularly because it’s easy to make! Bring them to a get together or serve them to your family! Preheat your oven to 350 degrees. Spray a 9×13 casserole dish with non­stick cooking spray. Combine the cake mix, melted butter, and evaporated milk in a bowl. Use a mixer or a wooden spoon (whatever is most convenient for you) to stir them together until combined. Add chopped candy and chocolate chips. The dough will be thick at this point, so don’t worry. That is how it’s supposed to look! Place your batter in the casserole dish and bake for about 20 minutes. It might take longer depending on the size of pan you use and your oven, so keep an eye on it. Do not overbake! You want them to be a little underdone, so they’re gooey and not too cakey. While your brownies are baking, make your caramel sauce. Over medium/low heat, mix brown sugar, half and half, salt and butter in a small saucepan, whisking frequently. After 5 to 7 minutes, stir in your vanilla. Cook for another minute and set to the side until your brownies are ready. Once out of the oven, drizzle the caramel sauce over the brownies and allow them to cool before serving. Enjoy! Spray 9x13 casserole dish with non­stick cooking spray. Combine cake mix, melted butter, and evaporated milk in a bowl. Use a mixer or a wooden spoon to stir together until combined. Add chopped candy and chocolate chips. Over medium/low heat, mix brown sugar, half and half, salt and butter in a small saucepan, whisking frequently. After 5 to 7 minutes, stir in your vanilla. Cook for another minute and set to the side until your brownies are ready. 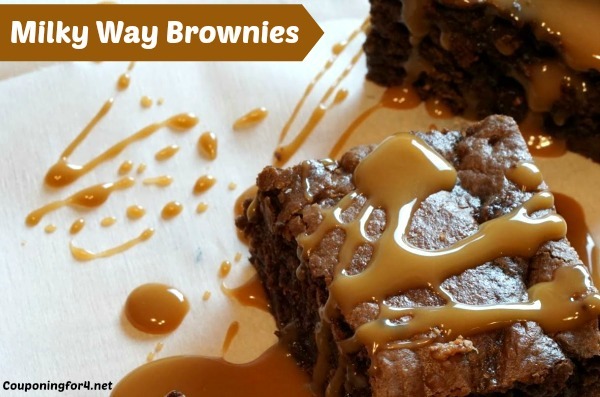 Once out of the oven, drizzle the caramel sauce over the brownies and allow them to cool before serving.